T8 Tubes are a highly used product everywhere you go. Why not save energy every single day by switching to LED. 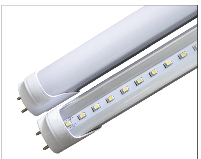 These tubes can be used with indoor or outdoor fixtures as well as electric or magnetic ballasts. These tubes emit the same amount of lighting as a fluorescent but at a fraction of the energy usage. It has become the best choice for many companies to use in their offices, warehouses and stores. *Product has a 5 year manufacture warranty. **All products and pricing are subject to change without notice.